Work began last week on a box-culvert replacement on U.S. Highway 56 west of Four Corners. The road is scheduled to be closed through mid-June, routing through traffic though Osage City. 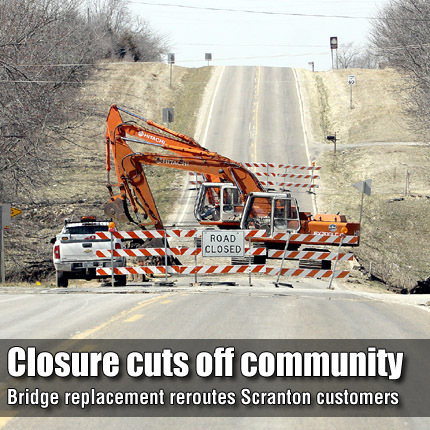 SCRANTON—A bridge replacement project on U.S. Highway 56 between U.S. Highway 75 and Scranton blocked out-of-town customers from conveniently reaching Scranton businesses. Employees said project has reduced traffic at the community’s only gas station and convenience store to local customers. The sentiment was shared by CP’s Branding Iron and Saloon, located directly across the street from Casey’s in Scranton’s downtown. Schuler was caught off guard by the closure, receiving notification by a road sign along U.S. 75. Official notification came days sooner, with the Kansas Department of Transportation (KDOT) issuing a press release on March 4, just 10 days before the highway was to close for three months. Notification was published in the subsequent edition of The Herald-Chronicle. A detour routes drivers through Burlingame to Osage City and then back to U.S. 75 via State Highway 31. Schuler said the impact could have been softened if they would have had time to notify their out-of-town customers of the closure. Schuler estimated between 40 and 50 percent of her customers are from out of town. With no convenient official detour, customers must find their way around, take the long way, or end up elsewhere. Burlingame businesses, which are accessible by paved roads from four directions, were less affected by the detour. Riggs said many of her customers were able to come in from the north on Auburn Road, a paved option that doesn’t exist for Scranton. Local drivers have had less trouble navigating around the closure, driving dirt roads north and south of Scranton. According to the original KDOT press release, the scheduled completion date for the $214,227 bridge replacement project is mid-June.